Some Antivius may flag a false positive. HyperStake is an Environmentally Friendly alternative to Bitcoin (BTC). You don't need any specialized or expensive mining equipments that consumes huge amounts of power just to participate. With HYP, all you need is a regular computer with an internet connection. This means anyone in the world can participate in the Hyperstake network. HyperStake's primary goal is to create a cryptocurrency that provides a generous return for securing the block chain without massive inflation. Currently, inflation is managed through the maximum stake reward of 1000 HYP coins per stake reward combined with a block target of 90 seconds, this means there is a limit of 960 stake rewards per day. 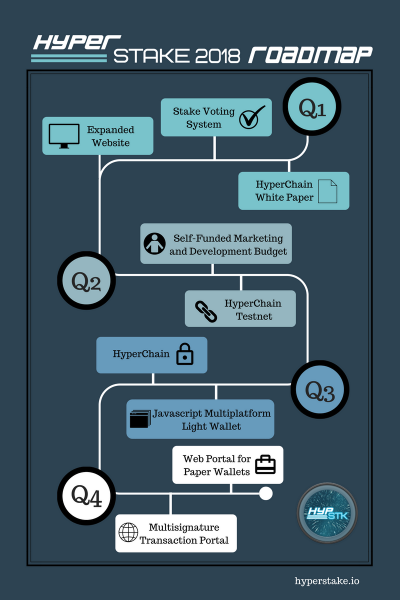 HyperStake has a very active wallet development, with unique features being added and tested all of the time by the community. It is common that HyperStake will have a beta wallet out for those willing to test out the hottest new features. How Does Inflation Control Work? Many have come to the conclusion that with such high difficulty, it is worth using bigger block size that will definitely hit max reward of 1,000, but will stake faster because of large size. See the splitting blocks tutorial for assistance. Also visit the inflation control wiki page and the inflation prediction website. - Advanced Coin Control: HyperStake has the most advanced version of coin control that has been implemented in any cryptocurrency wallet. The wallet allows you to easily select coins in mass via our coin filter box. The HyperStake wallet provides much more information than the standard coin control implementation, displaying columns like Age, Stake Weight, Estimated Days to Stake, and Potential Stake Value. - Block Splitter: Split your coin blocks (our name for UTXO's) in one simple transaction. No need to use multiple transaction to split a coin block of 100,000 HYP into 20 coin blocks of 5,000 HYP. See this quick tutorial video for an overview. - RPC Coin Control: We have added the ability to use the complete coin control tool-set via RPC. This means that users that run the daemon will not be left behind. - MultiSend: MultiSend is a rebuild of what used to be called Stake For Charity (s4c). MultiSend allows a user to automatically send a percent of their stake reward to as many addresses as you would like. The MultiSend transaction is sent when the staked coins mature (30 confirmations). The only current restriction is that you cannot choose to send more than 100% of your stake using MultiSend. MultiSend is a perfect tool for sending reoccurring payments to a friend, sending part of your stake to a dice site, sending part of your stake to IRC, or even sending part of your stake straight to your exchange address. View the MultiSend Wiki Page for more information. - Stake Split Threshold: HyperStake tries to give the user more control over every aspect of staking possible. By using the "setstakesplitthreshold" RPC call you are able to tell your wallet when you want your staked coins to split or to stay combined. - Disable Stake: The HyperStake wallet allows you to disable your staking if certain parameters are met. Currently you can set your wallet to disable your stake by monitoring your wallet stake weight or network difficulty. - liteStake : Previously the staking process would continuously rehash the same hashes over and over, needlessly taking up valuable CPU power. HYP added a std::map that tracks the block height and the last time the wallet hashed on this height. Depending on your staking settings, the wallet will not begin a new round of hashing until after a certain amount of time has passed, or a new block is accepted. This means that there will be 1-5 seconds of CPU hashing once every minute, compared to continuous CPU hashing. This is a non-mandatory wallet update. Loading time has gone from 6-7 minutes, to about 1 minute now. It also has the new stake calculator. Only windows binary currently available and Mac OS is in the works. Replace old stake calculator with new logic that gives size guidance based on median staked weight over the last 1,000 blocks. Adjust coin control weight to be equal to min(days old, 30 days) multiplied by the coin amount. Syncing Notice: When syncing the chain, the client can get stuck occasionally and need to be restarted in order to continue syncing. Please consider using the bootstrap for the quickest sync. Usage: extract bootstrap.dat into data directory (for Windows go to "run" and type in %appdata% and find HyperStake folder), remove blkindex.dat and blk0001.dat. When you fire up your QT wallet, it will automatically detect the bootstrap and begin to work. Bootstrapping may take an hour or two depending on the machine, please be patient, the bootstrap happens from the splashscreen, and clicking on it while bootstrapping may cause it to quit. Please note that it is common for the bootstrap to load 90k or so blocks at a time and jump out of bootstrap mode (fixed in v1.1.3). If your client does this, simply turn it off. Go back to your datadir and rename bootstrap.dat.old to bootstrap.dat and restart your client, it will pick up where it left off. Windows: "appdata/roaming/HyperStake" directory. If you don't know how to find the appdata directory,, right-click on windows "Start" > "run" and type in "%appdata%" and hit enter. Linux: "/home/username/.HyperStake" (may slightly be different depending on your setup). Mac: "~/Library/Application Support/HyperStake" which is the same as "Users/username/Library/Application Support/HyperStake"